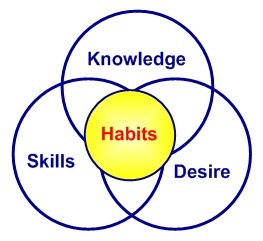 Developing Habits - learned behaviors. Habits are learned human behaviors. They are not innate, therefore we are able to develop new habits and stop bad habits. We can develop good habits such as automatically putting on our seat belt once you get in your car, and break bad habits such as biting our nails or smoking cigarette. Creating productive habits is just as important as creating personal goals. It is the habits you have on a daily basis that will get you to your ultimate goals. Some goal objectives or tasks may be better suited as being a habit rather than being an activity requiring active motivation. The more positive habits you can develop the more productive and enriched your daily life will be. By starting with just a little discipline, you can create a new habit that requires little effort to maintain. Believe – You need to have a firm belief you can create the habit. Your thoughts and feeling will govern your actions, so believe you can make the everlasting change. If not, no matter what you decide to change, you will never have the conviction to achieve your goals. Commit – make a commitment for one full month to whatever habit you decide to create. Some experts say it takes about 21 days to either create or break a habit. It probably takes longer for most people to really create a sustainable habit, but the 21 days is a good starting point. If you can make it through the initial conditioning phase, it becomes much easier to sustain. A month is a good block of time to choose since it puts you past the initial 21 days and it easily fits in your calendar. Make the commitment to begin and follow through. Start small and simple – Do not try to completely change your life in the first month. Choose one or two habits which you can build on in the future. If you try to create too many new habits, you may become overwhelmed and become deterred from accomplishing your goal. If you want to create a habit of eating all healthy meals, you may start by focusing on eating a healthy breakfast for the first month. After you have successfully created that habit, you could begin to include a healthy lunch in the second month. List the benefits – List out the benefits of the having new habit and place them in a location you will see often. A reminder of the benefits will help you persist when you get the urge to quit. Work with friends – Find others who want to create a similar habit. This will provide a network for support and encouragement as well you keep you motivated if you feel like quitting. Have a Plan – Do not just think of a new habit. It is best to have a plan on how you will accomplish your task. If you want to create a healthy eating habit, have a plan on what you will eat each day. This way you will know what you will need to buy so you will have it available. Without a plan, people often fall back into their old bad habits. Also, it is a good idea to write down your plan. Having a written plan gives you a visual reminder what you will need to do to successfully create your habit. Take daily action – Both continuous effort and consistency are critical if you want to make a habit stick. If you want to start exercising, go to the gym every day for your first thirty days. Going a couple times a week will make it harder to form the habit. Activities you do only once every few days are harder to create as habits. Track your progress – keep track of how far you have come and how much you have accomplished. You can also announce and track your new habit on social media like Twitter or Facebook. This can also aid as a reminder and as a support mechanism from friend and family. Reward yourself – After you have accomplished a significant goal or objective, give yourself a reward. For example, if your goal is to lose weight, you may consider buying a new outfit when you reach a certain targeted weight.